A record number of men packed into the basement of the Cathedral of St. Catharine of Siena, Allentown on a beautiful March morning, sharing in conversation, freshly baked donuts and coffee, in preparation for Bishop of Allentown Alfred Schlert to give a Lenten talk upstairs in the Cathedral, followed by Father Bernard Ezaki. Whereas years prior had seen a normal crowd size ranging between 65 and 100 men, this year saw 165 registered and in attendance. The second speaker was Cristian Rojas, who had a pivotal hand in putting the morning’s events together. 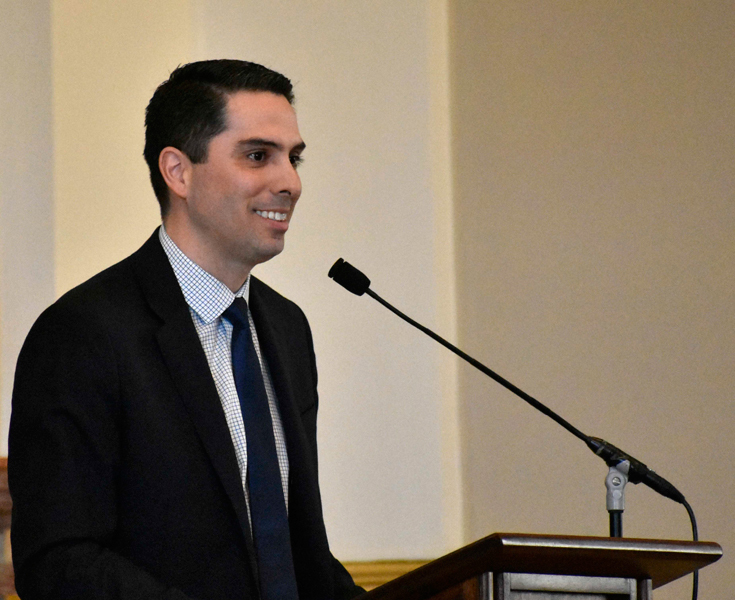 Rojas advocated the need for men both of youth and experience, of all backgrounds, ignited by love of the faith. Rojas had the pews in stitches as he recounted how precisely he’d been led to do so, relating a late-night post-pregnancy McDonald’s run – where he both forgot his wallet and bumped into Bishop Schlert. The morning crowd smilingly nodded in approval. Ascending the ambo, Bishop Schlert read from the Book of Sirach. He then spoke on how this Lenten season we must focus on something unspoken of these days. 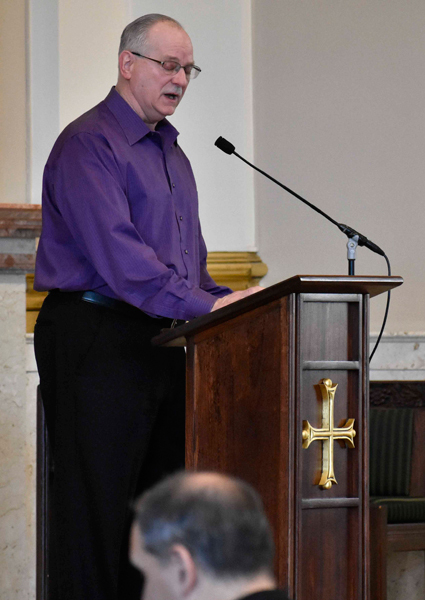 “The quote from Sirach speaks about shaking the wheat until the husks are shaken out,” said Bishop Schlert. He pointed out, “The ruggedness of Lent can especially appeal to the masculinity of men. “The Church needs men's masculinity as much as the Church needs the femininity of women. Both complement each other and are equal in the life of the Church. One hundred years later, in 2012, the Costa Concordia capsized off the coast of Italy. While many passengers died, the captain abandoned his ship and fled to shore. Which example of masculinity best serves society? “Masculinity, virtuously lived, is necessary in our society. It is not ‘toxic,’ but rather fulfills an essential role in the marriage, in family, in the Church and in our nation. Deacon Mike Doncsecz welcomes the men to the morning event. Cristian Rojas talks to the group about the Commission for Men, which sponsored the Lenten event. 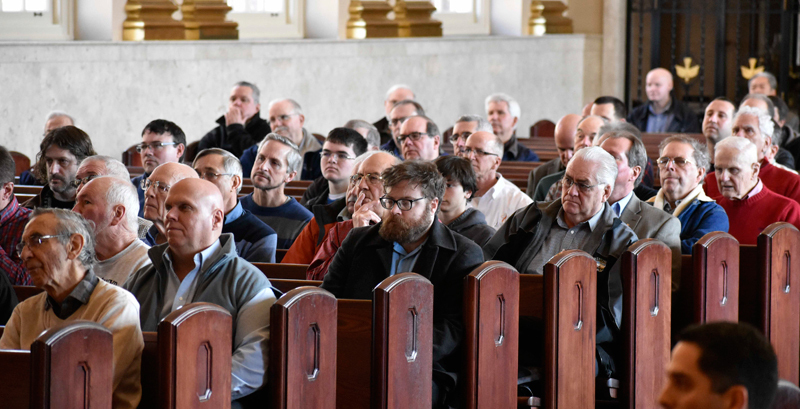 Men listen during the talk by Bishop Alfred Schlert. 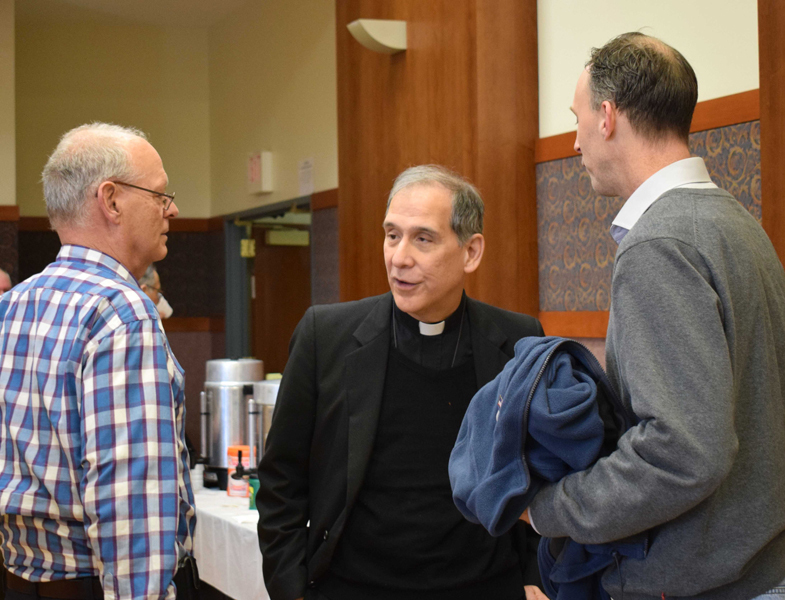 Father Ezaki chats with Roy D'Ginto, left, and Tim Haring.